As an innovation, the taskbar under Windows 7 automatically shows preview images as soon as the mouse pointer hovers over an element. This can however be confusing in a browser with several open tabs. You can set the properties individually without having to deactivate the useful function entirely. For most of program how the preview should be in the taskbar. This is how you suppress the disturbing preview images or activate the preview in case it is not active by default. In Internet Explorer 8 open “Tools | Internet Options” and then in the “General” tab, click “Settings” in the “Tabs” field. In the next dialog, the option “Show preview for individual tabs on the taskbar” determines the desired preview properties. You can deactivate the value activated by default if the preview in the taskbar is unclear and disturbing. Confirm the open dialog with “OK”. In Firefox, enter “about:config” in the address bar and press the Enter key. Confirm the warning with a click on “I promise I will be careful”. In the input fi eld “Filter”, enter “browser.taskbar. previews.enable” and to edit, double click below on this parameter. Change the setting from “false” to “true” if you want to activate the preview, or deactivate it in the same manner. The setting becomes effective immediately. 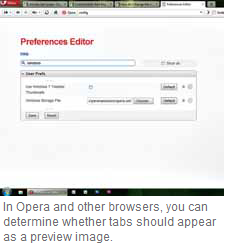 Similarly, in Opera, enter “about:config” in the address bar and press the Enter key. Then click the “UserPrefs” item to fade in the list of advanced configuration settings. It is given to the far right below the “Use Windows 7 Taskbar Thumbnails” item. By default, this option is deactivated. You can activate it using the allocated control box. Then scroll to the end of the list and confirm the setting by clicking “Save”. Finally confirm the message to successfully change the parameter with a click on “OK”. NOTE: Google Chrome currently does not have an option to change the preview option of the browser. The preview is generally only available if Aero is activated in Windows 7.